The home and museum opened to the public for tours in 1974 and includes three structures: the museum, carriage house (where the coachman and his family lived and currently used for offices and meeting space) and the main house, available to the public only by tour. I would not recommend this tour for young children. While children under age six are free, I think tours are better suited for kids ages 8+. Most areas and artifacts in the house are not roped off and it would be tempting for little ones to touch or want to sit down. For children who do attend the tour, there is a scavenger hunt and clipboard. Children must find approximately 20 objects and can return a completed hunt in the gift shop for a small prize. The museum building is handicap accessible; the home is not. There is an option for a reduced fee, first floor tour if you can walk through the museum to the house. There is no place to sit on a tour; be prepared to climb flights of stairs to the second and third floors, and then back down to the first floor. Restrooms are located on both floors of the museum. The home is located in downtown Hartford, right next to Hartford Public High School. There is a large parking lot located behind the house. There are several stairs to get into the museum, but there is a handicap ramp. There are two options for purchasing tickets: in the lobby of the Museum Center or online here. There are several tour options, but most tours last between 60-75 minutes. I would suggest reserving tickets online, especially if you’re going on a weekend or holiday. Use the restrooms on the first floor before the tour starts. There is also a coat room and lockers for personal items. There is a terrific gift shop with tons of Twain themed gifts, books, housewares, and even a section of gifts for children. Plan on spending about an hour before or after your tour to explore the museum. There is a 20 minute introductory video in the auditorium that provided background information on the Clemens family. The Aetna Gallery includes a timeline of Clemens’ life, benches to sit and listen to audio clips of readings from his collection, artifacts from his life, and the infamous “Paige Compositor” that he invested heavily in, only to lose a significant portion of his wealth. 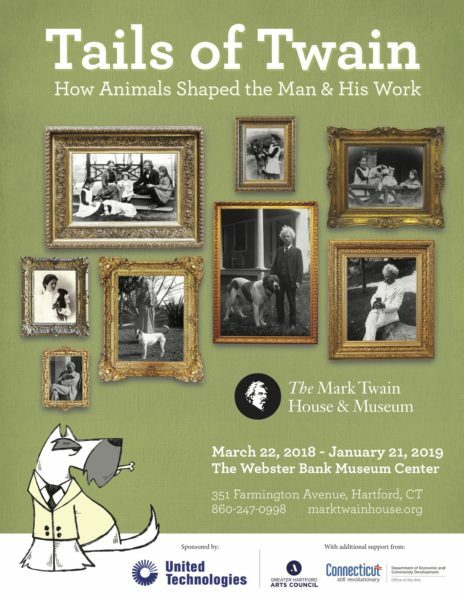 The Tails of Twain exhibit (currently on display until mid January 2019) explores the love Clemens had for animals, especially cats. He owned over 30 named cats. There is also a sleigh Clemens owned and used in his last home in Redding, Connecticut. Nursery: filled with with a doll house, tea party set up, doll carriages, and plenty of play dolls. Third floor Billiards Room: billiards table and Clemens writing desk(s). Clemens had two desks: one that faced the billiards table and one that faces a blank wall, where Clemens actually wrote, not distracted by the game. Kitchen: a sample menu for an eight course dinner party that Clemens and his wife routinely held. Eating Nearby: The Nook Farm Cafe is located on the second floor and offers pre-made sandwiches, snacks, sweets, and drinks, many of which are from local establishments. Hartford is filled with plenty of full service restaurant options. Check here for a good list. Disclaimer: I was provided a media pass to visit the Mark Twain House and Museum. All opinions expressed are my own. 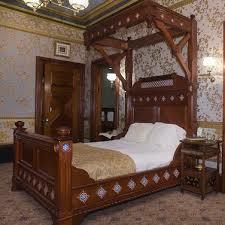 Interior photos are courtesy of the Mark Twain House & Museum, as photography is not allowed inside the house or museum.